It doesn't matter if it's water, air or oil: your garage needs a rugged, high-capacity hose and reel combination to reliably deliver essential resources and materials to your automotive projects. That's why we built Ranger spring-driven hose reels to be some of the best in the business. Plus, with the spring mechanisms inside the Ranger Spring-Driven Hose Reels, you can always depend on our hoses to clean up after themselves. 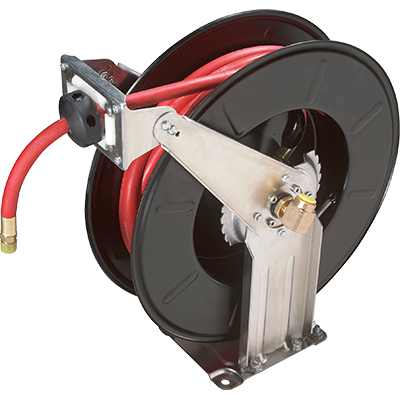 Ranger spring-driven hose reels incorporate robust construction, virtually indestructible materials and superior design. We've specially designed our spring-driven hose reel systems to keep your hoses pumping and your work space clear of long, intrusive hoses when you're done. That's the beauty of the Ranger hose storage system. Easily unwrap one of our super-duty hoses and put it to work pumping air, water or oil. The Ranger reel rewinds itself back into a nice, neat bundle. Ranger hose reels are just one more way that Ranger makes your life in the garage a whole lot easier. The industrial-grade Ranger RH-50PL is a premium hose reel that features reinforced, dual support arms.